I love a good challenge and had been so excited about this particular one… but gold? Even though it took about forty-seven ideas and nineteen redirections, I’m really happy with what this project has added to my kitchen. 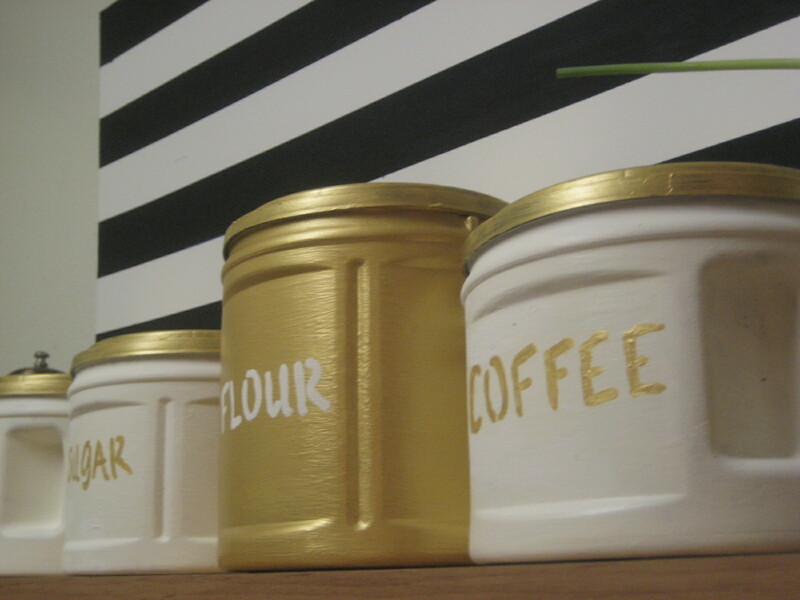 DIY Gilded Canisters (made out of plastic Folgers coffee cans). 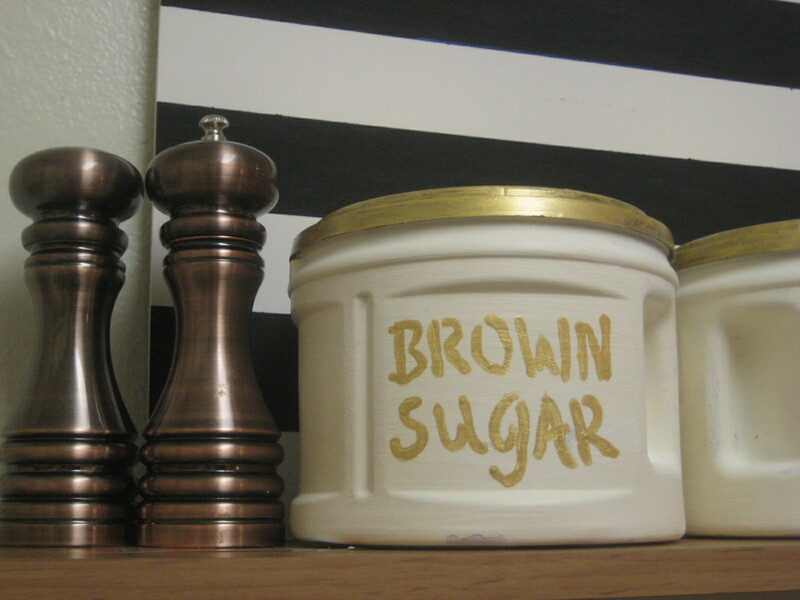 I’ve been saving our Folgers coffee containers for months now and turning them into canisters for flour, sugar, etc. They’re perfect! They hold much more than regular canisters and easily fit any measuring cup. 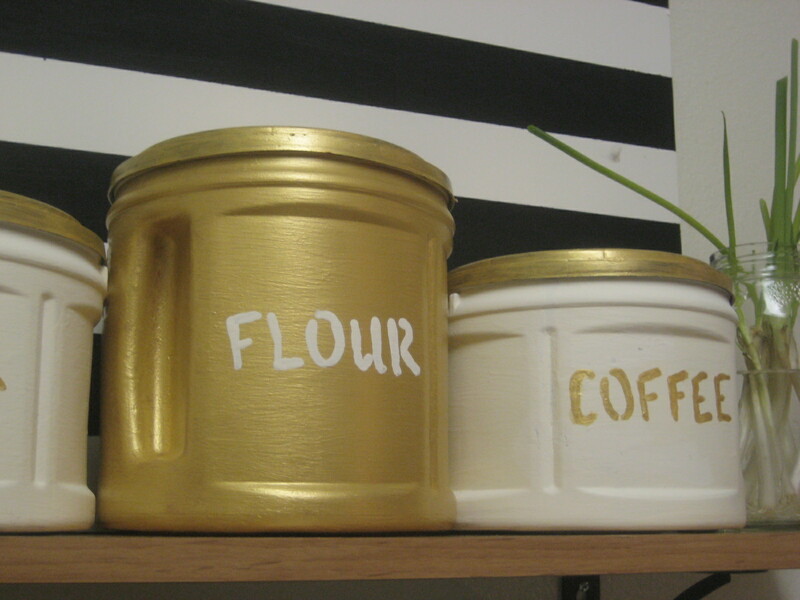 My original idea sounded easy enough: paint three of the cans a vanilla color with gold lids, and make the flour can all gold. 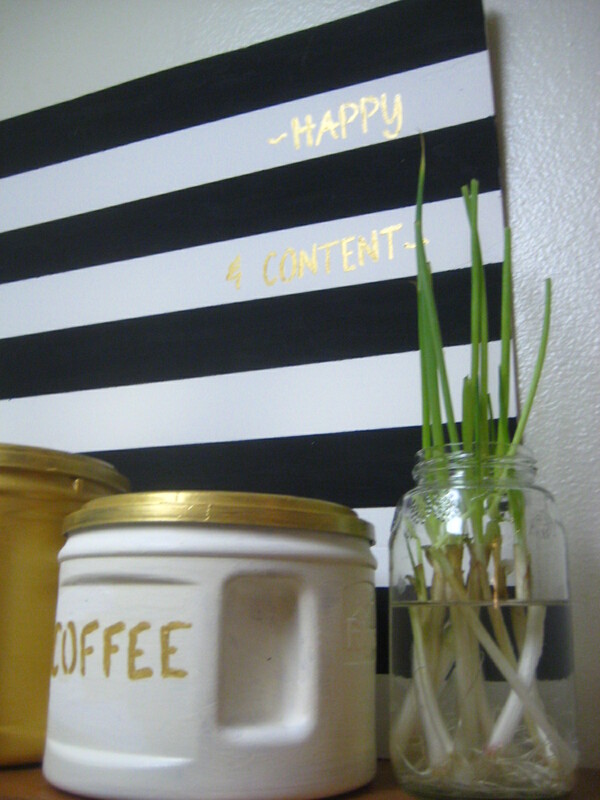 Then I wanted to stencil the words on because I love that look. If only it had been that easy. I could not get the stencil to work on the rounded cans and ended up free-handing with a q-tip and the wooden end of a very small paint brush. Be warned: I am not a skilled DIY-er. And I also cannot handle being detailed and perfectionistic with crafts. They’re supposed to be fun and creative! Hey, using Scotch Blue to help my words be straight was about my limit. Speaking of Scotch Blue, it began to peel the paint off… grrr. A young man at Michael’s assured me that any craft paint would work on the plastic. He said that if I spray paint it with high gloss afterwards that they would even go through the dishwasher. I seriously doubt this because, as already said, the Scotch Blue peeled some of the paint even after it was glossed. And no, I did not put these through the dishwasher yet because I didn’t want my whole project to wash away! Honestly, don’t do these the way I did it! It would have been much better to spray paint. I think. Most likely, I am going to end up re-painting these with spray paint. And while I’m confessing… this project was way more for me than just “gilding something.” It involved semi-making and putting up a shelf; creating a background; stenciling; accessorizing… hopefully, I’ll post more on that next week. However, I am so happy that I took this challenge. A huge thank-you to Darlene from Fieldstone Hill Design for coming up with this awesome series. Have you heard of it? You should check it out here. So fun! Super cute! So here’s my question – how were you able to get the coffee smell out of the canisters before adding your other food items? Or did the canisters not smell? What if you don’t have a dishwasher? I love this idea! 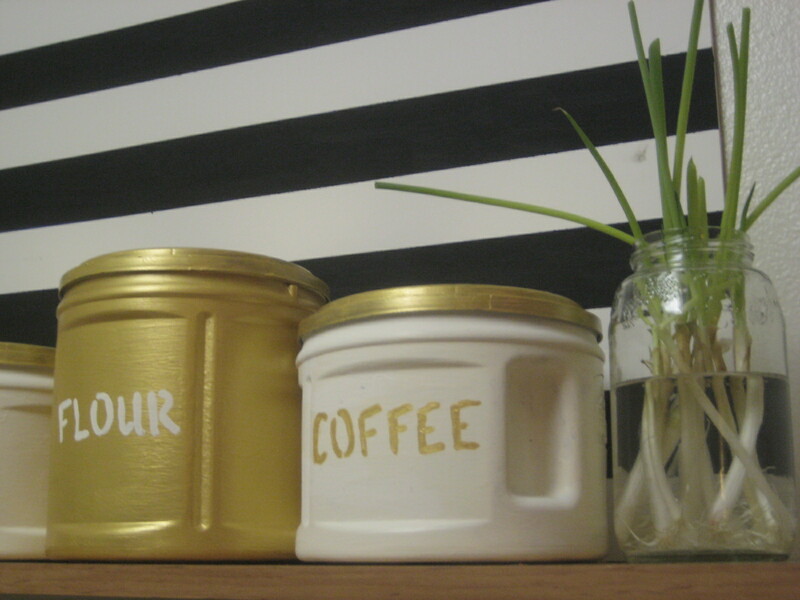 What a clever way to reuse those canisters! I think they turned out great and your “instructions” totally cracked me up. 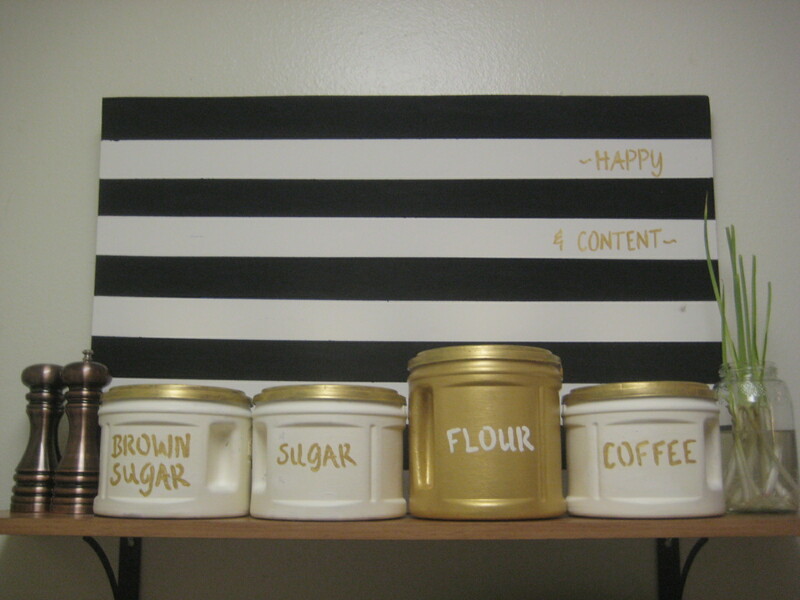 I definitely spray paint whenever I can–so much easier! For plastic I would probably do a spray primer first (just for future reference!) Such a great idea! I really like this! it looks great in gold! 🙂 sorry to hear it was difficult painting these! I would be scared of putting them in the dishwasher, I would be scared it would come off and they look so pretty now! So fun! I’m super excited that next month is framing fabric – yay! Thanks so much! I think our collective problem is the scotch blue paint. It ruined my project today! But I think yours is so creative! i never would’ve guessed those were plastic! Thanks for linking it up to Ditto DIY today! What a SUPER creative idea!!!! love it! SO SO glad you joined us Christie! I would not store food in plastic containers. It’s recommended to only use glass. But cute and useful for other storage.